There aren’t too many occasions when repeating a study is worth the cost, but when Nike chose to feature Colin Kaepernick in an ad campaign one week after we completed an AI-moderated qual-plus-quant study asking Americans how they feel about brands taking a stand, we simply couldn’t resist. Nike created a real-life case study. In cooperation with 747 Insights, our original study intended to better understand the nuances of opinions among four major generations of adult Americans. The original results demonstrated that the four generations – Gen Z, Gen X, Millennials, and Boomers – all had somewhat reserved opinions about brands taking a political/social stand. Gen Z, the youngest of the group with their older members just graduating from post-secondary education, unsurprisingly had the most lenient opinions. However, they still felt brands should avoid extreme issues. Millennials, those with young families, felt that brands shouldn’t create tension but it might be okay if the issue isn’t offensive and the brands really believe in it. Gen X, those with older and college-aged children, felt that it’s not their business to comment on a brand and that brands probably aren’t doing it for the right reason. And finally, Boomers, the original hippy defenders of justice who are about to retire or have retired, felt that brands shouldn’t take a stand unless the issues aren’t controversial. And then Nike featured Colin. Colin Kaepernick is a professional athlete who took a stand and ‘took a knee’ during the national anthem during nationally televised football games to protest racial injustice. Those actions generated extreme controversy, arguments, and shoe-burnings and, two years later, he remains unsigned by professional football leagues. For his refusal to bow to pressure, Amnesty International awarded Kaepernick the 2018 Ambassador of Conscience award. Nike took a stand by featuring Colin in their ads. With any other athlete, the tagline, “Believe in something, even if it means sacrificing everything,” could have been a comment on athletes struggling their whole life with personal and financial challenges to become successful athletes. But with Colin, we know Nike had grander ideas in mind. Nike took a huge stand. With a real-life example to map, we repeated that portion of our generational study with 100 people from each of the four generations. The results were surprising. With a specific example on which to reflect, attitudes became much more clear. 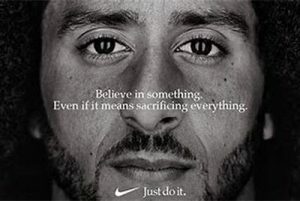 Each of the four generations expressed varying opinions on whether brands should take a stand – with Millennials actually viewing Nike the most positively for featuring the ad. Curious to learn more? Download the full Beneath the Trend report here. Beneath the Trend is a series of research studies aimed to learn more about consumer and marketing trends. In cooperation with SoapboxSample and leveraging Quester’s artificial-intelligence moderator, we conduct 15-minute qualitative conversations with hundreds of people to quickly deliver rich, qualitative insights about a current trend. We’d love to hear your suggestions for the next BTT! Quester® is award-winning consumer intelligence firm that uses proprietary artificial intelligence technologies to conduct multi-lingual qualitative research on a quantitative scale. We specialize in yielding superior consumer understanding in areas such as innovation, concept development, brand positioning, segmentation, and path to purchase. Our online software-based moderator and analytical software probes deep into participant thought processes, analyzes responses, and allows researchers to make wise business decisions grounded in data, and has netted Quester an EXPLOR Award from the TMRE and an Ogilvy Award from The ARF. Learn about our DIY tools on our website.